Netflix's stock is up more than 10% in just the past few days. It must be due to the new trailer for "A Very Murray Christmas." Right? But Netflix's recent stock performance is no joke. Shares have rebounded nearly 20% since Netflix's earnings "disappointed" investors last month. Netflix finished the third quarter with more than 69 million subscribers. But Wall Street was hoping Netflix (NFLX) would top 70 million. The stock is now up 140% this year, making it the best performer in the S&P 500. Netflix is just 8% below its all-time high. What's fueling the recent rise? Excitement about international expansion is a big part of it. 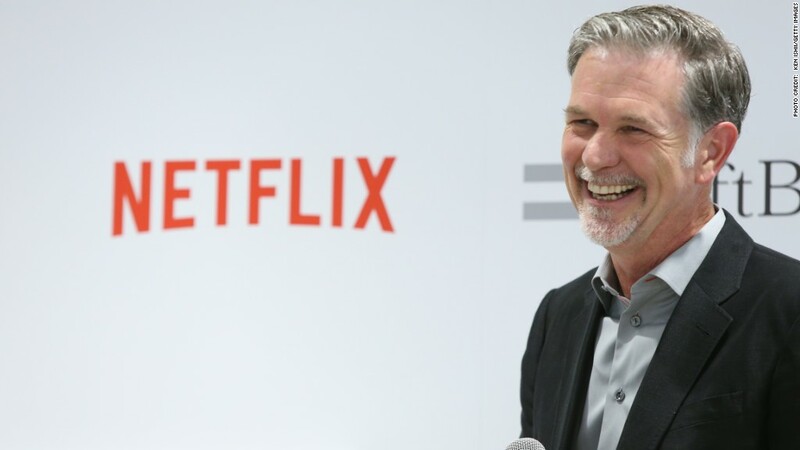 Netflix is betting heavily on growth outside of the United States. And that gambit appears to be paying off. The Australian Communications and Media Authority said in a report this week that Netflix had 2.5 million subscribers in Australia as of the end of June. Pretty impressive considering that Netflix just launched in The Land Down Under in March. Asia is a major area of focus as well. Netflix started streaming in Japan in September. The company has plans to roll out the service to South Korea, Hong Kong, Singapore and Taiwan early next year. Netflix is also expected to benefit as more and more consumers watch TV shows and movies on their smartphones. Networking equipment firm Ericsson (ERIC) predicted in a report this week that mobile video traffic will grow 55% a year between now and 2021. Ericsson added that the two biggest winners from this trend appear to be Google (GOOGL)-owned YouTube and Netflix. Hedge funds revealed what stocks they bought and sold in the third quarter earlier this week. That may have helped boost Netflix's stock as well. Investing guru George Soros bought more than 300,000 shares of Netflix -- a new position for his firm. Well-regarded hedge funds Viking Global and Renaissance Technologies acquired new stakes in Netflix too. And big mutual fund firms Fidelity, Vanguard, BlackRock and State Street all boosted their investments in Netflix during the quarter. I've already mentioned the Bill Murray Christmas special. Of course, Netflix needs more than one-time events to bring in new subscribers. And it looks like there are some potential new hits on its roster. Netflix has several new series debuting this month, including "Master of None" from comedian Aziz Ansari, anime show "Seven Deadly Sins" and "W/ Bob and David" -- a new sketch comedy series from "Mr. Show" creators Bob Odenkirk and David Cross. But the most hyped new series is "Marvel's Jessica Jones" -- the second of four planned Netflix originals based on characters from the Disney (DIS)-owned Marvel comic book powerhouse. Netflix"s "Daredevil" launched earlier this year and was a huge hit. "Jessica Jones" will start streaming on November 20. So Netflix is no longer just the place for "House of Cards" and "Orange Is the New Black." Netflix clearly has a lot going for it. But is the stock ahead of itself once more? Shares trade for more than 450 times 2016 earnings estimates. That's obscene. And the company's market value is now $51 billion. To put that in perspective, Netflix is within spitting distance of passing major old media companies Time Warner (TWX) -- which owns CNNMoney -- and Fox (FOXA). Time Warner's market value is $57 billion while Fox has a market cap of $59 billion. Netflix still faces a lot of competition from these media giants. Time Warner is considering an investment in Hulu, which is backed by Fox, Disney and Comcast's (CMCSA) NBCUniversal. Apple (AAPL) and Amazon (AMZN) are rivals as well, and both of them have more financial firepower than Netflix. But none of these challenges are necessarily new. Netflix has pretty much been an overvalued stock since it went public in 2002. So bet against Netflix at your peril. The stock is proving to be as indestructible as the infamous gopher from "Caddyshack" that Bill Murray's Carl Spackler tried in vain to kill. "I'm Alright" by Kenny Loggins could be Netflix CEO Reed Hastings' theme song.